It feels like a new pair of “truly wireless” headphones is unveiled practically every week of late, but it’s not every day that you see four different models announced by an audio brand as popular as JBL. The Harman-owned manufacturer of speakers, soundbars, and home theater systems has just taken the wraps off the JBL Reflect Flow, Endurance Peak, Tune120TWS, and UA Flash earphones at CES 2019 in Las Vegas, as reported by Engadget. The main thing that separates these four is obviously the external appearance, each meant to appeal to a (slightly) different target audience. But you’ll also want to take note of what makes them special in terms of specifications. 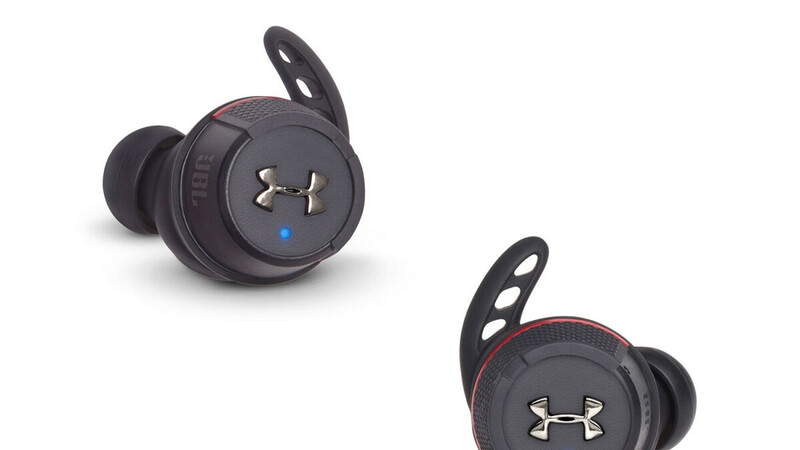 The UA Flash or UA True Wireless Flash are the costliest of the bunch, at a recommended retail price of $169.95, a premium justified in part by JBL’s branding collaboration with Under Armour and in part by a robust list of features. Lightweight and “completely” waterproof, these earbuds boast a total battery life of 25 hours, including 20 hours of juice delivered by a sturdy aluminum charging case. The UA Flash also stands out with something called Bionic Hearing, a proprietary technology allowing the user to choose from TalkThru and Ambient Aware listening modes either amplifying voices around you or maximizing background noise. At $149.95, the JBL Reflect Flow look pretty similar to the UA Flash, also promising an ergonomic design and fit, IPX7 waterproofing, “signature” sound technology, the same aforementioned Bionic Hearing capabilities, and a whopping 30-hour combined battery life. The $119.95 JBL Endurance Peak are slightly less advanced and, frankly, a little uglier than their “cousins”, with a TwistLock design that’s meant to be convenient rather than stylish, a more than decent 28 hours of combined battery life, and yes, IPX7 water resistance as well. Finally, the $99.95 JBL Tune120TWS manage to be “trendy and slim”, naturally downgrading the headphones + charging case total endurance to 16 hours, and making do without water resistance. On the bright side, the low-cost wireless earbuds can connect to Google and Apple’s voice assistants to make hands-free stereo calls. That’s not too shabby, now, is it? UPDATE: In addition to the four new models highlighted above, JBL introduced its LIVE series of headphones and earphones. Without a doubt, the JBL Live 650BTNC is the most exciting member of the bunch, packing fancy features like active noise cancellation, touch controls, and aluminum design accents. The inclusion of Google Assistant and Amazon Alexa support is another major selling point. Battery life is rated at up to 20 hours – or up to 30 hours if you keep ANC off – which is on par with the competition. This particular set of around-the-ear wireless headphones will set you back $200. The JBL Live 500BT (around-the-ear design) and Live 400BT (on-ear) offer much of the same at lower price points – $150 and $100, respectively. While they lack active noise cancellation, they let you take advantage of JBL's Ambient Aware and TalkThru tech, amplifying or letting through ambient sound to keep you aware of your surroundings. Virtual assistant support is also present. The 500BT lasts up to 30 hours, while the smaller 400BT gets through 24 hours per charge. The smaller, lighter JBL Live 200BT is a set of neckbuds with nothing fancy going on. Priced at the reasonable $70, they come in various colors and last up to 10 hours per charge. And lastly, the JBL Live 100 is the only set of wired earphones in the lineup. Priced at $40, they plug into your phone's 3.5mm headphone jack... if it has one. All of JBL's new earphones and headphones are currently on display at CES 2019 in Las Vegas. Look nice. Wait and see the reviews on these. See if they have connection issues and stable sound. i am hopeful on these, although the current JBL on the market are nothing special. i was lucky enough to be able to chose between Bose sound sport free and the Sony Wf-1000x. I tyhink the bose sound better in quiet environment but the Sony are better on everythign else; noise canceliing for the train rides or plane, connection is very good and the sound is about 5-10% less than Bose. compared to the Jabras, i think right now Sony is the king of the hill. what do you guys think? agree or not? I bought the Jabra Active 65t based on a Flossy Carter Review.... Cnet, the Verge and as far as all of the features the best unit has, noise canceling, talk through, bluetooth 5.0, immediate synchronization and no dropping of sound or connection with my Note 9..... All around Jabra for the win. All the reviews place Jabra above Sony. I HAVE no loss of sound during video or music play back. As soon as I take them out of the charging case they are linked to the phone. The left side always synchronize with the right immediately and never disconnected. the UA flash look nice. looking to replace my gear iconx 2018 who had an unfortunate meeting with the washer.